The Ford Torino Talladega was Ford’s 1969 NASCAR ringer car. It had a highly sloped fastback and a 428 Cobra Jet engine. For 1970, Chrysler seriously upped the game with the Plymouth Superbird, which would dominate NASCAR. So Ford designer Larry Shinoda designed this aerodynamic coupe based on the Torino. 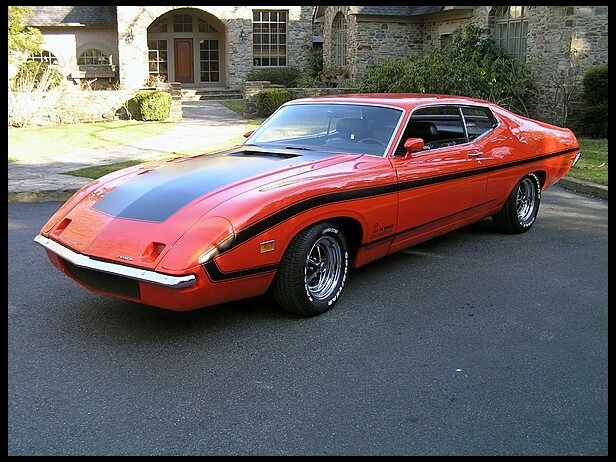 Everything from the firewall back is standard Torino, but that sleek, downforce-creating front end was all new. The grille was relocated to below the bumper and the hood was blacked out. And there were headlight covers planned for the NASCAR teams (this car has them). NASCAR upped their homologation requirements for 1970, mandating that 3,000 copies of a car must be built in order to compete. This led Ford to abandon the project after only three prototypes had been built. It was never raced. Each car had a different engine: one had the Boss 429, one a 429 SCJ and the other a 429 CJ. So this car has either an engine rated at 370 or 375 horsepower (the lot description is currently blank for this car). It is one of only three and should bring a pretty penny, even though Torino’s are not (for whatever reason) highly collectible. Click here for more info and here for more from this sale. Update: Sold, Mecum Kissimmee 2019, $192,500. This entry was posted in Uncategorized and tagged 1970, auctions, cars, classic cars, ford, king cobra, mecum, muscle cars, torino by classiccarweekly. Bookmark the permalink.